It’s back-to-school time and class is in session … Orkin is back with Household Pests 101 – featuring some of Orkin’s scientific knowledge of pests. The Orkin Man is here to help you #LearnWithOrkin so you don’t get schooled by pest problems in your own home. But Back-To-School doesn’t just mean for the kids. Orkin knows that moms are on the go more than ever and wants to make sure you’re all set when driving the kids to soccer practice, racing to make it to school on time and just maybe getting a minute for yourself! Back-to-school time is a great time to #LearnWithOrkin about pest prevention. Take the Pest Prevention Pop Quiz to find out if you know how to think like a pest! 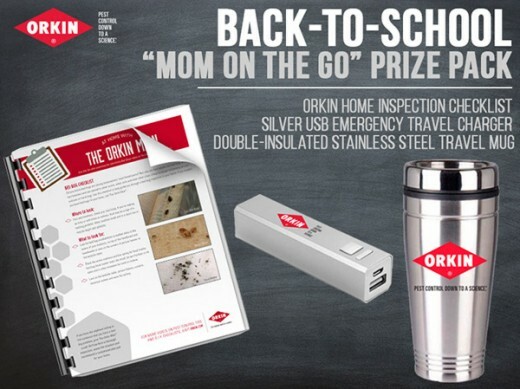 Win it: One lucky reader will win an Orkin Prize Pack: Silver USB Portable Charger, Double Wall Stainless Steel Travel Mug, and Orkin “Protect Your Home” PDF Checklist. This giveaway will end September 1st at 11:59 PM EST. The winner will have 48 hours to respond to my email. If no response, a new winner will be chosen. Prize fulfillment will be made by the sponsor, I am not responsible for prize delivery or lost or stolen deliveries. Open to residents of the US. I learned that flies are filthier then roaches.. I was really surprise to lean that! I learned that just inspecting your house for wood damage is not enough to insure protection from termites! The best way to get rid of spiders is to get rid of other pests. I learned that a mouse can get through a dime-sized hole. I learned that the house fly was worse than the cockroach as far as contamination goes. I was surprised to learn this. I learned that it is difficult to get rid of spiders unless you get rid of other bugs. I learned that flies carry the most germs! I learned that managing other insect populations will reduce spiders’ food source, thereby reducing their chances of survival in the home. Flies are dirtier than roaches. Ewwwwwww!